Happy New Year! So, I was reading somewhere online that the most popular resolutions involve losing weight, exercising, stopping smoking and doing a better job with money. Can we offer a suggestion...read more books! Ha! And to help you out, we're kicking 2014 off with a bunch of terrific book reviews. In a nutshell: Eighth-grader Nate Foster jumps a Greyhound to New York City to try out for the Broadway musical ET. Nate’s sidekick, his best friend Libby, helps with the plans and covers for Nate back in Jankburg, Pennsylvania. Nate and Libby are big-time into musicals and show tunes. Nate deals with quite a lot over a little less than 300 pages. He’s overweight. He’s gay, but hasn’t figured it out yet. He doesn’t fit in at school and is bullied. He doesn’t really fit in at home where he lives with parents who aren’t getting along, a mother with a drinking problem and a perfect-and-athletic big brother. Surprise! This book is humorous. What I liked a little less: Okay, this is super picky: but there were times that I wanted Nate to at least consider the more obvious solutions. Quick example: he doesn’t have a parent with him to sign the paperwork at the audition. Surely, surely he’d think about forging a parent’s signature. Right? Right. Still, this is very small potatoes in a book that was funny and entertaining while touching on tough subjects. No small feat! In the future: I’d like Child #4 (my eighth grader) to read this. I’m curious to see if she picks up on the gay theme. And I’d like to know what she thinks of the humor. We have very different senses of humor. Also, I plan to read the sequel, FIVE, SIX, SEVEN, NATE!, which comes out later this month. And, now, onto to everyone’s thoughtful, insightful reviews! You'll love them! Good New Year's Resolution! Nate sounds like a fun read. I like how you broke it down by what works and what could be improved. Thanks for hosting! 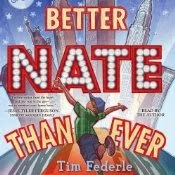 Sounds like some pretty heavy issues that Nate is dealing with, but I'm glad the book is humorous. Resolving to read more books sounds like a great idea, though I don't think I need to make this resolution--I have a long list of want-to-reads for 2014! Hi Sarah! Thanks for the comment. I always find it difficult to talk about what didn't work in a book for me. I have this image of the author, huddled over a computer, typing his/her fingers to the bone. I like the sound of this one, warts and all. The warts sometimes provoke more thought for me than the parts done well. I'm adding it to my winter reads pile! You had me at jumps a Greyhound for New York City to try out for the Broadway musical ET. Definitely one to pick up. I'm impressed that the author managed to deal with such heavy issues in a humorous way. Good review. And Happy New Year, all! I like your resolution idea :) Though I think my resolution needs to be to finish reading all the books I have before buying any more!